A few days ago, I got to about level 14, and realized that I was finally getting on top of the game. I was barely eking by before– my loot after each mission was only just enough to buy ammo and stimpaks and repair weapons. But then one quest gave me 2100 caps, another left me with over 25 stimpaks, and I have ammo to burn. Plus I can take out almost anything. Not much later, I checked the Fallout wiki, and learned that I’d already finished almost all of the side quests. This makes me sad. 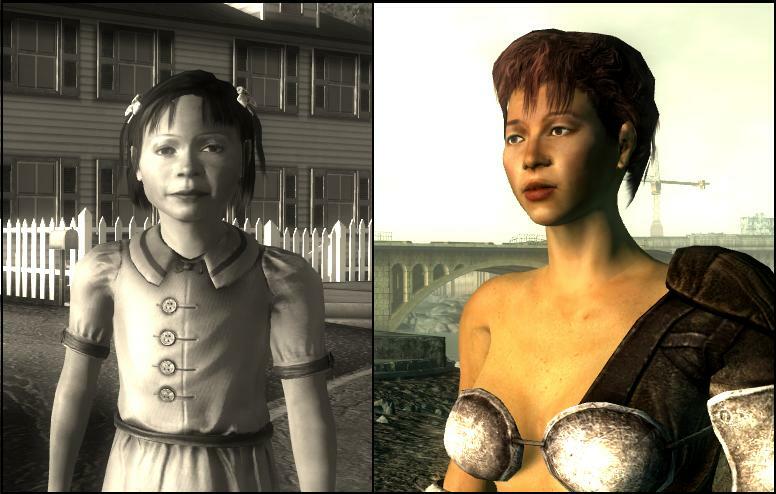 I love the open-endedness of the Bethesda games, and the Fallout 3 quests, compared to Oblivion, can be solved in more ways and with a much wider range of moral choices. Also realized, I was a pretty ugly kid. Though I think I grew up nicely. Still, it should take awhile yet. (You people who’ve finished already, how did you do it? I thought I had time on my hands.) There are a few meaty quests left, plus interesting locations like Raider strongholds that aren’t even quests. I could take a fair amount of time just collecting things for people who want them: scrap metal, Sugar Bombs, map locations, pre-war books, holotags, radioactive cola, and fingers. One thing I could use less of, though: crashes. The game just freezes up sometimes– mostly, for some reason, in small rooms. I can wander the Wasteland for hours, but go into a small house and it crashes. It made the Tranquility Lane quest almost unplayable, which is a pity, since I’d’ve liked to explore it more.